The U.S. Embassy in Jakarta warned U.S. citizens Friday to avoid crowds and "keep a low profile" as protests had the "potential to become violent." All age groups attended the protests, with many carrying Palestinian flags and scarves in a show of solidarity. 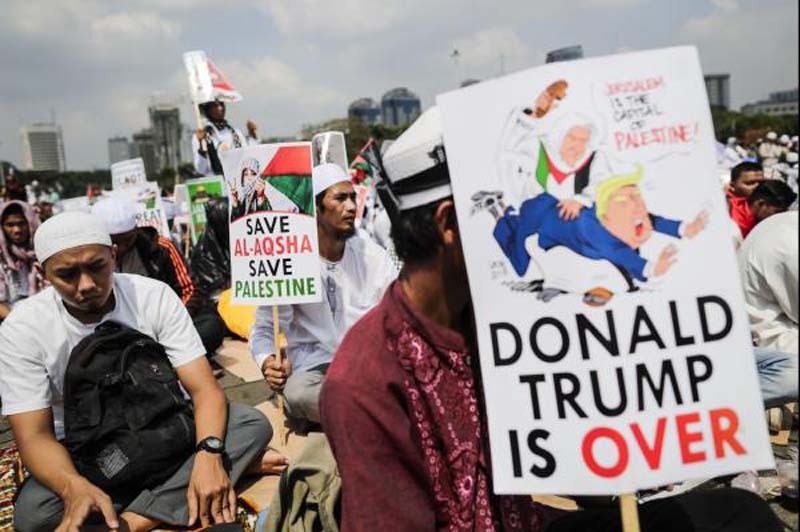 The rallies took place the same day Indonesian President Joko Widodo denounced the U.S. decision to move the embassy. "Indonesia strongly denounces the decision to move the U.S. Embassy to Jerusalem, as it violates various Security Council resolutions and the U.N. General Assembly," Jokowi said. "With the people of Indonesia, we will continue to fight for the Palestinians, who are always there in every breath of diplomacy of Indonesia." A senior Palestinian official, Ahmad Majdalani, said Monday's embassy opening will be "a day of rage" as more protests are expected to take place. U.S. President Donald Trump sparked outrage across the Muslim world in December in announcing the relocation of the U.S. Embassy and the recognition of Jerusalem as the capital of Israel. "We finally acknowledge the obvious: that Jerusalem is Israel's capital," Trump said of his decision. "This is nothing more, or less than a recognition of reality. It is also the right thing to do. It's something that has to be done." Following the footsteps of United States, Paraguay will be moving its embassy in Israel to Jerusalem by the end of May. Guatemala is also moving its embassy. Trump won't attend Monday's move in Jerusalem. In his place, Deputy Secretary of State John J. Sullivan will lead the delegation, the White House said. U.S. Ambassador to the State of Israel David M. Friedman, Treasury Secretary Steven Mnuchin and assistant to the president Jason D. Greenblatt will also attend, along with Trump's daughter, Ivanka Trump, and son-in-law, Jared Kushner, who serve as advisers to the president. Palestinian officials have said the embassy move was a violation of international law, while Israeli Prime Minister Benjamin Netanyahu praised the decision.